This is a 50m2 apartment with a bedroom ( with double bed 160x200), room with a sofa bed for two people (and all the equipment you need for your comfort, such as heating, cable TV and wireless Internet, DVD, washing machine etc ...), a fully equipped kitchen (oven, microwave, fridge, kettle, toaster) and a bathroom with bath and toilet. Sheets and towels are included in the rental price. Check-in between 14:00 and 20:00. Late check-in between 20:00 and 22:00 available for a supplement of 30. Check-in after 22:00 is not permitted. Check-out between 07:00 and 11:00. Just as nice as the pictures indicated. Everything was new, stylish, clean and comfortable. We couldn't ask for better! A centrally located but relatively a quiet neighbourhood. The apartment is spacious and well-furnished. The apartment itself was beautiful and comfortable, and the owner friendly and helpful. We found the noise level from Boulevard St Germain very loud because we opened the windows open for fresh, cool air. un apartamento muy práctico, bien cuidado y muy bien situado cerca de una zona interesante y de autobuses y metro. Typical, clean, beautiful parisian appartment - it is not possible to improve. Would return, again and again and again! Scared to send this in case it is booked up next time we want to go!!! It was a great apartment, exactly as the web description indicated. However, on the Friday and Saturday nights, even though it's on the 5th floor, there was a lot of street noise from bars etc until 4 am. Also, being right above a major street meant that emergency services, with sirens, were ...frequently passing at all hours. However this also meant that there were many restaurants and sights nearby. Metro was right outside the building. Much better than expected. An excellent place to stay in Paris. The apartment on Rue DuFour was perfect in all ways. It made my stay in Paris all the more magnifigue!!!!! Everything about this apartment was fabulous. The apartment was exactly like the images presented online. It was spacious, well located and the kitchen was wonderful for someone wanting to shop the markets and make meals at "home." The single drawback was the outside noise at night, particularly... on the weekend. Ear plugs took care of that pretty well. I will most certainly stay in this aparatment on my next trip, assuming it isn't already rented by everyone reading such a positive review. This was the first time I had rented an apartment in Paris after many years of traveling there. 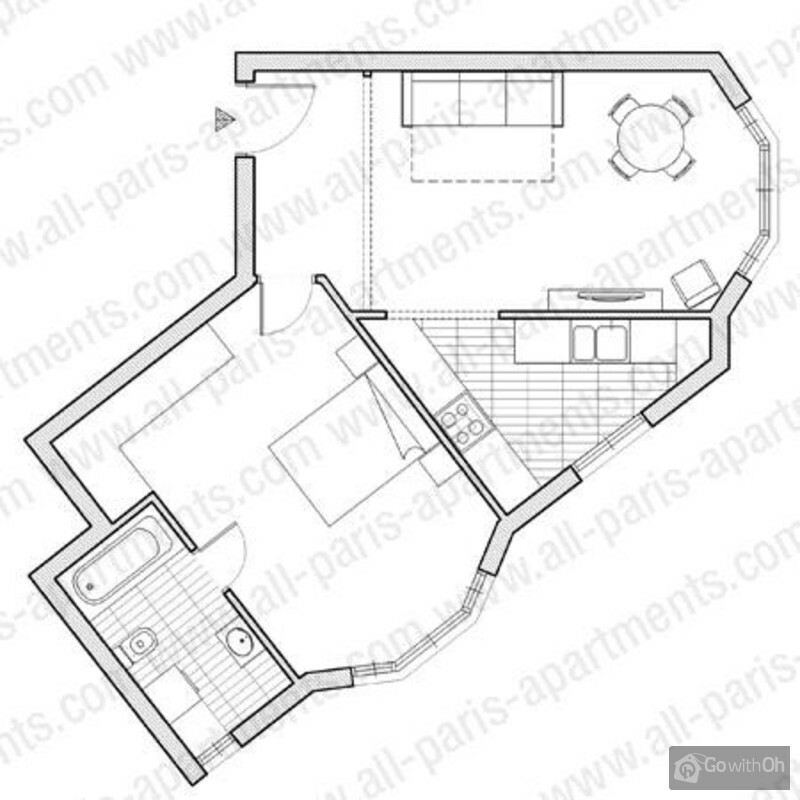 The process iwth All-Paris-Apartments was clear, thorough and easy to follow. I will certainly do it again. Beautifully situated and immaculately presented inside with lots of kitchen facilites. nice towels, extra pillows etc. Bit of traffic noise, but central situation offset this, and with windows closed was fine. Much better than staying in a similar priced hotel. Good website, photos etc, and very ...helpful rep once in Paris, contact phone no's if any problems, concierge in appt block. 10/10 Appartement très confortable, très bien situé et très bien agencé avec un atout charme non négligeable. Le quartier est très vivant et le métro à proximité La personne qui nous a reçus s'est montrée d'une extrême gentillesse... une adresse à retenir! Formidable experience. Nous reviendrons au meme endroit pour nos futures voyages parisiens! Il dépassé mes attentes , excellent !!! L'appartamento è veramente eccellente, posto in una situazione ideale, fornito di tutto e la signora è cortesissima. Il rumore della strada è ben neutralizzato dalla chiusura delle finestre, che danno su un panorama notevole. Consiglio veramente a chiunque voglia godersi una vacanza nel centro ...di Parigi di prenotare questo alloggio.....e vi invidio....vorrei tornarci presto!!! 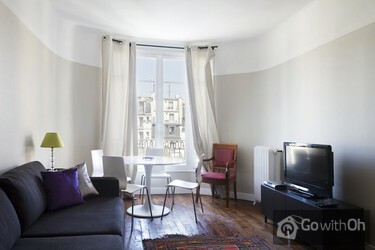 The apartment is chic and beautiful with everything needed for a comfortable stay in paris. the decor is beautiful with both modern and elegant aspects. Excellent location-spacious-well appointed-some street noise but not a problem. 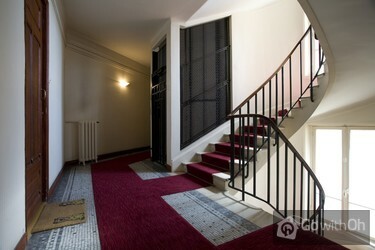 easy to use the excellent website all paris apartments-will use in the future! Die Wohnung ist richtig gut. Sie ist mit allem ausgestattet, was Mann/Frau für einen kurzen Urlaub in Paris braucht. Vor allen Dingen sind das Bett und das Schlafsofa sehr gut. Die Lage ist genial, weil man den Louvre, oder Notre Dame bequem zu Fuß erreichen kann. Ausserdem ist es ein richtig ...nettes Viertel. Auch die Metro direkt vor der Tür ist praktisch. Nur der Lärm von Draußen und das Knarren der Parkettfußböden im Haus ist sehr groß. Es ist eben eine viel befahrene große Straße. Unterkunft war wirklich gut und kann ich weiterempfehlen. Sehr zentral gelegen, auch wenn wir den Geräuschpegel im Rahmen der Buchung etwas unterschätzt haben. Alle Ausstattungsgegenstände der Wohnung waren gut und funktionierten. WLAN tadellos. Kostenlose Telefonate zum Festnetz in andere ...Länder gratis möglich sowie innerhalb Frankreichs möglich. Sofabed im Wohnzimmer etwas durchgelegen. Apartement war uns anfangs zu warm. Fan/Ventilator leider nur für ein Zimmer verfügbar. This is a fantastic apartment! It is in a wonderful area, with lots of great cafes, restaurants and shops. It is also very convenient for accessing the metro to get around to Paris' sites. The apartment itself is just as lovely as it looks in the photos on the website. We will definitely be passing it on to any family/friends looking to visit Paris. Muy cómodo. Amplio. Muy bien equipado. La localización inmejorable, así como el metro justo debajo de casa. Una sola pega: mucho ruido exterior a primera hora de la mañana. Perfecto para madrugadores. This was a lovely apartment, bright and roomy. It was very well located for cafes and restaurants, and of course the Metro,. It was noisy at nights. We would recommend it to our friends. Pues, si lo conseguimos, será nuestro hogar en París todos los años que se pueda. Nuestro emplazamiento y espacio ideal en la ciudad. Es perfecto. Liebevoll renovierte Altbauwohnung mit Wohlfühleffekt. Schöner Blick auf die Pariser Strassenszene des St. Germain-Viertels mit zahlreichen Boutiquen und Strassencafes. U- Bahn am Haus, fast verzichtbar wegen zentraler Lage (15 min Fussweg zu Notre Dame). Verkehrslärm erträglich. It is perfectly located from transport perspective with easy access to food markets and shops. Very good location for metro, shops and entertainment. Flat clean and bright, well furnished. Second visit here and would definietely return again. Bit noisy from street early mornings - bin collection, road works - but to be expected as is city centre. 17/20 . le radiateur du sejour ne chauffe pas,le robinet est bloqué. le lavabo de la salle de bains il manque la tige de fermeture du clapet. This was the perfect appartment for us. We stayed for 1 week here on our first time to paris. The appartment had everything we needed and it was spacious and clean. The view from the living room window overlooking the main street was exactlty what i had expected of paris. It overlooked many ...cafes and a busy street. The description of this appartment says there is a balcony. There is no balcony to australian standards, just wondows, but this was fine. There is a taxi Rank accross the street which was very convienient and many cafes/supermarkets/pharmacies and clothes stores in every direction very close by. The street noise was loud at night time, we are young and quite enjoyed the action on the street. However i can see how it may bother some. All other districts are easy to access although we took taxis the whole week which is always easy. The contact person was very easy to communicate with and very helpful. I even asked if there a full length mirror in the apartment and she told me there wasn't but that she would get one for me. Sure enough there was a portable full length mirror when we arrived. I was amazed at her willingness to help. Wifi was excellent and free phone calls to Australia. Everything was perfect. The apartment was exactly as described, easy to find and excellently located in the centre of St. Germain with a miriad of shops and bistros in the vicinity it is tempting to go no further. The accomodation was clean, there no shortage of hot water, it has a decent shower and the bed is reasonably ...comfortable. Only quible (and it is only a quible) is that even though it is on the 5th floor it is a little noisy at night time due to the proximity of local bars and bistros. Not a problem if you are used to city living but if its peace and quiet you are after this may not be the one for you. Lovely spacious, well equipped apartment in a superb location. Much better than a hotel. Would definitely book again. It is a lovely apartment and very close to everything. It is a little noisy in the weekend but would still recommend highly. The apartment is very well located and very nice. Das Appartment leigt sehr günstig und mitten im Geschehen. Ein Parkhaus ist in unmittelbarer Nähe. Nach unserem Geschmack dürfte es etwas ordentlicher gereinigt werden, aber trotz dieses kleinen Mangels keinen Grund zur Beanstandung. La ubicación del piso es muy cómoda y muy céntrica. Hay una estación de metro justo fuera del edificio. La dueña es muy amable y agradable. El piso y el edificio eran limpios y bien mantenidos. Muy recomendado! I loved this apartment. Excellently located, it was spacious, airy and beautifully furnished, with every amenity one could need in a kitchen, living room and a bedroom. The bathroom was clean with a great shower. Our contact person was polite and helpful, and did everything possible to ensure that... we were comfortable. One slight disadvantage was a difficult lock to the front door - there's a knack to it that I recommend be shown to guests on the first night! I fully intend to book this apartment again. It was wonderful. Thanks so much! It was a great apartment & in a great position but it had not been maintained very well. The floors were dirty & 4 lamps had bulbs that were not working. The basin in the bathroom was also missing the lever to let the water out. Our communication with the owner was very good but the guy that met us ...at the apartment was asleep when we arrived, maybe he should have been doing some maintenance & also should also have told us where to empty the garbage. Very comfortable apartment with all facilities. A very busy but very active area of Paris with many cafes and retaurants to choose from. Access to Metro at your doorfront providing easy travel to all popular sites. Very straightforward booking online that then provides liaison with contact person in... Paris via email. Easier than other online booking sites that I have used. Geniale Adresse für alle Liebhaber des 6. Arr. Das Apartment ist groß, sauber und zweckmäßig eingerichtet. Einkaufsmöglichkeiten sowie Cafe`s und Restaurants sind in großer Menge vorhanden. Alle wichtigen Sehenswürdigkeiten sind zu Fuß in akzeptabler Zeit erreichbar. Es ist zwar nachts ein ...wenig laut aber dafür ist man " mitten drin, statt nur dabei". B. was very knowledgeable and welcoming when we first arrived. The apartment was clean, tidy and ideally located and although small it was bigger than similarly priced hotel rooms. The small balcony is perfect for watching the locals go about their day. All in all i was very happy with the ...apartment and the next time we come to Paris I'd book the same. Remember it is Rue de Four (door is next to Ben and Jerry's Ice Cream parlour) just right beside Mabillon station. For some reason looking at where the red tack fell on the map we thought it was further up! Ideal location to connect to different parts of Paris either by metro or by simply walking ...when the weather is good. It is near the Jardin de Luxembourg and is a must for a picnic in good weather of course. B. was very helpful and welcoming and the accommodation was very pleasing with a lovely view. We would consider going back there on our return. If you are looking for a Thai meal while there try Le Manderin just round the corner from the apartment. Great value and lovely tasting food. Accommodation was perfect for us and in a fantastic location, only rated good instead of excellent as could have been a little cleaner, nevertheless would definitely stay here again. Great location- comfortable apartment-our second visit! Everything was exactly as it was described in the photos and description of the apartment. We couldn't have asked for better. The location was perfect. We walked to everything including the Eiffel Tower. There are a multitude of restaurants, chocolate/icrecream shops, galleries and clothing stores ...in close proximity. There is also a department store five minutes walk. We got lost getting to the apartment (our fault wrong train station) but our greeter gave us directions over the phone and waited patiently even though we were half an hour late to arrive. Es nuestro hogar en Paris. Qué más se puede decir? Mientras se pueda, regresaremos cada año. A lovely and spacious place to stay in the heart of the Left Bank. A delightful view from the lounge of Blvd St Germain and Rue De Buci. Noise not a problem for us. Two lifts and a wide staircase is a good feature. L'heure de rendez-vous a été respectée et avons pu avoir l'appartement rapidement après notre arrivée de l'aéroport. Hochpreisig, aber das Geld wert. Für zwei Personen nett. The apartment is just lovely and is exactly as described and shown if not better! My husband and I stayed for six nights and from the moment we arrived we were welcomed. The apartment really has everything you need and is very comfortable. The location in Saint Germian is in my opinion one of the ...best in Paris with easy access to amazing shopping, a supermarket Monoprix only a few blocks away, excellent cafes and restaurants! 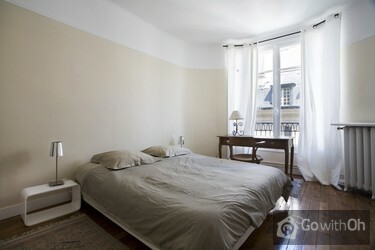 It truly is a fantastic apartment to call home while experiencing all Paris has to offer. The metro Mabillon is literally outside the front door or you can walk a block and take the Saint Germain line. Also a little surprise next door is the tiny 'Cupcake' bakery which sells miniature bite size delicious delights served by the friendliest of Parisienne's. I highly recommend this apartment and my husband and I look forward to returning to Paris and staying again! Great place and location. We highly recommended. Perfect to walk to anywhere. The metro station right infront is a plus. Good restaurant around. We love Le Relais de l'entrecot. Thoroughly enjoyed our visit. The apartment was clean and well appointed, comfortable and brilliantly located and all contacts and arrangements were smooth and efficient. Minor detractions were; the state of decoration in the living room which clearly suffered a leak from the apartment above, the ...fact that the sofa bed - extended - had a defect by dropping out of the track, bedside lighting not adequate for reading in bed and the noise from early morning refuse collection in the street below. Sounds a lot but really minor considerations given the positive aspects of the apartment and whole experience. Location excellent pourtant un peu bruyant. Service excellent. Have stayed in this flat before and loved to return. Location is excellent. However since last visit water has come through ceiling in living room and signs of mould throughout flat. Therefore flat needs decorating throughout. We found using the door key tricky but figured it out.I meentioned it to Butch on the departure day and this did seem to be common problem with other tennants so maybe we are not used to european door locks. I accidently locked the washing machine 2 days before departure. B came and unlocked it ...that day. I also experienced a power outage late at night. Once I notifed B in the am, L and B arrived very concerned and keen to resolve the issue. The matter was easily and quickly resolved .B and L are very friendly, professional and keen to esure stay is comfortable.Traffic noise being the only down side to our stay. Unseasonal hot weather during our stay meant open windows. The unit receives a lovely breeze - however open windows allow the noise in. We would happily stay again perhaps not in summer though. St Geramin is rich with resturants and everything you need is virtually in a space of a city block. 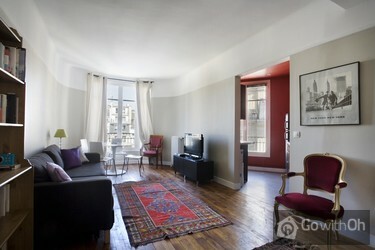 Close proximity to major attractions and the Seine makes its postion fantastic. I stayed 8 days longer than my husband and i always felt safe. The unit is clean, has a nice feel about it, has a great location, is as pictured. We felt very safe. On arrival at the apartment we were delighted with its location. You could not wish for anything more central and in a buzzing part of the City. Mabilion Metro is literally at the door step and gives wide links to the rest of the network. The junction is a busy crossroads which is bustling with ...life and at times it can be a little noisy at night but this did not hinder us in anyway. The apartment enjoys a lift which is welcome if you have several cases. The apartment is clean and very well presented. Only a couple of minor points in that some paint work requires to be repaired on the ceiling and that a couple of the wall sockets did not appear to work. The oven also does not work and appears to be in pristine condition and never in fact used. We will be back. We had a very good time there. The welcome was great. The studio is super centric close to all in Paris. We have only one suggestion. To give a 10 score to the flat it needs maybe a paint refresh! We already recommended it to a couple of friends:) Thanks for everything and for sure we will repeat the experience. El departamento es muy cómodo y está ubicado en una zona privilegiada. Tiene todo lo necesario para una estadía perfecta y además es precioso. Sin duda lo recomiendo y volveremos. La comunicación con el contacto fue fluida y la atención constante. Los unicos puntos en contra que puedo ...mencionar es que a la llegada no aceptan tarjeta de crédito y eso fue un tema que L gentilmente ayudó a resolver buscando opciones que finalmente no fueron víables. Otro tema que para nosotros no fue conveniente fue el horario de check in después de las 4pm sin opciones para dejar el equipaje. Een prima appartement op een goede centrale locatie, met een prettige inrichting. Handig was dat de schoonmaakhulp de etenswaren zoals koffie, theezakjes, suiker enz. laat staan, zodat het direct voor iedere volgende gast praktisch is te gebruiken. Suggestie : kies voor een steviger ronde tafel. B met us for early check-in/bag drop-off. It is in a great location, but very noisy if you have the windows open. Cafes/food markets/Metro are at your front door. We were briefed on apartment details, but there was only a one page info sheet in English (internet/Wi-Fi logon, phone info and minor ...info on washer/dryer). User manuals are located in a kitchen upper cabin for some appliances (TV, microwave, stove, etc. ), but not one for the Bosch washer/dryer combo. We found one online in English, which really helped us: http://www.manualslib.com/manual/274234/Bosch-Wvd24520gb.html?page=8#manual The apartment is great with a good size kitchen and large bedroom with plenty of closet space. The bed slept well, only had a fitted sheet (no flat sheet) with duvet cover/down comforter. We were right in the centre of St Germaine district, great restaurants surrounded us, along with bakeries, markets...you name it, it was there. Walking distance to the SPOTS one has to see...Louvre, Notre Dame, Musee d'Orsay, river cruises, We walked our feet off for a week. Even though it is ...right on the main thoroughfare we were not too disturbed by noise. 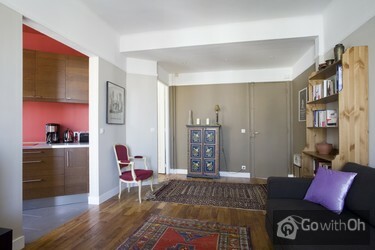 The apartment is wonderfully located in one of the nicest neibourhoods in Paris. Gerne wieder, obschon die Strasse am Wochenende etwas laut ist ;-). Die Wohnung braucht unbedingt Renovierung. Die Bettdeck hatte überall Flecken und die Farbe fiel von den Wänden und der Decke. Außerdem stimmt irgendetwas nicht mit dem Belüftungssystem im Bad und es ist wirklich laut. A very nice apartment, very well located. Comfortable, spacious and in a very lively neighborhood. The only negative was a very strong buzzing noise from the bathroom that kept us awake all night.Otherwise highly recommendable. 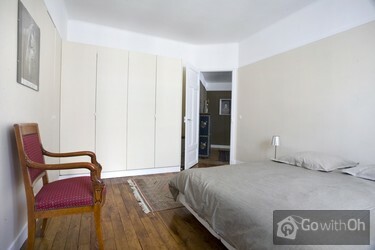 This apartment is in a great area of Paris and right near a subway stop. Check in was quick and easy and the apartment was comfortable. 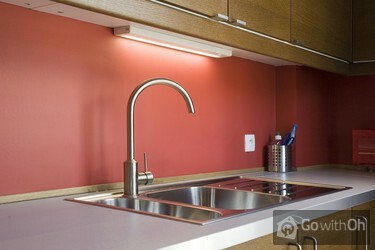 The kitchen was modern but could use some essentials like soap and dish cloths. The rest of the apartment could use some minor updating. We would stay there again. Right in the middle of one of he busiest areas of the Latin Quarter. If you're looking for somewhere quiet this may not be for you. We thought it was great. The apartment was beautiful, in a fantastic location and the owner was a pleasure to deal with. We had a great time, flat was great, amazing location, everything managed well and smoothly, would definitely book it again. Overall pretty good. Good size, adequate furniture, good appliances.However, the floors, cutlery and crockery could have been cleaner.Also, the lavatory cistern was leaking and though we offered to stay in for a plumber to fix it, we were left with the job of managing it by turning the water supply ...on and off as we used it.Also, no hand towels and no containers for items such as sugar, salt, cereal etc.We were there two weeks and the flat was not cleaned during that time and we had to launder the sheets and towels ourselves.We had the windows closed the whole time because it was very cold in February; if we had to open the windows, the traffic noise would have been unbearable. Lovely apartment, lots of light and very clean. Great communication with the check-in person, overall we had a lovely time here. This is a really beautiful flat - loads of character and a lovely 'feel'. 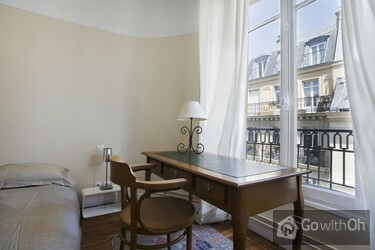 Location is spot on - the bedroom is over a pretty quiet street, but the lounge looks right over the Boulevard St Germain, so you can watch the 'bizz' of the city pass by. A couple of parts of the flat are a looking a little ...bit tired (grouting in bathroom, paint in bedroom) but these are really minor issues. Short walk to shops, restaurants, bars - perfect! The apartment Is a short distance to metro stations but also easy walking to major tourist sights. Lots of bars and restaurant in the surrounding streets, a buzzing area. Easy to reach using the RER B line no problems. The apartment can be a bit noisy at night as all the bars and restaurants open late. That is city living though. The apartment is in a great location, close to the metro and attractions. A little bit noisy with all the action but did not worry us. EXCELLENT LOCATION IF YOU LIEK BEING IN THE HEART OF ST GERMAINE. THE APPARTMENT ITSELF IS WELL EQUIPPPED AND WELCOMING. WELL EQUIPPED WITH ALL NECESSARY APPLIANCES AND THEY WORKED WELL. THE BUILDING ITSELF IS CLEAN AND WELL MAINTAINED WITH HEATING THROUGHOUT. Ubicazione ottima con splendido affaccio su Bd Saint Germain in casa elegante. Viene indicato per quattro persone, ma in realtà è confortevole soltanto per due, anche per l'ubicazione del bagno con il solo accesso dall'unica camera da letto. Arredo scadente e in cattivo stato con scarsità di luci. Una sola padella disponibile in cucina! Very nice room in a perfect location. Comfortable for two or three people. A short walk, Velib ride or Metro trip to anywhere you want to go in Paris. Or just stay in the neighborhood and enjoy some of the best bakeries, cafes, restaurants, shops, parks, museums and churches in the city. Dear guest, we appreciate and value your feedback which we have passed on to the owner. The owner informs us that the rolls that allow the opening of the sofa bed do indeed move but that the sofa bed is not broken. This is the fourth time that we have stayed in this apartment and the location is excellent. Owner / agent are great and all is very easy for booking and check in/out.The flat itself has become very tired with water damage on walls of bedroom and bathroom and lamps and lights not working.In reality ...it needs complete redecorating and new furniture and fittings. Having said that we still enjoyed our visit and staying in the flat. Location is the best! But as the place is noisy is not possible sleeping with the windows opened, this is a problem in the summer because there is no air conditioner. appartement à situation excellentemais mal isolé et très bruyant. Mobilier inégal cuisine très bien aménagée. Lage, grösse und Ausstattung gut. hygienemässig müsste das Reinigungspersonal kontrolliert werden, bzw. dem Personal eindeutig mehr Zeit als jetzt vorhanden gegeben werden, um effektiv zu putzen: vor Ankunft meiner Frau musste ich die schwarzversdreckte schimmlige Duschbrause sauber schruppen und... Stockflecken an Badewanne wegmachen.Abwicklung mit Besitzerin :unkompliziert.